Thoracic surgery is done on the chest, but it does not involve surgery on the heart. With robot-assisted thoracic procedures, the doctor guides small robotic arms through keyhole incisions. 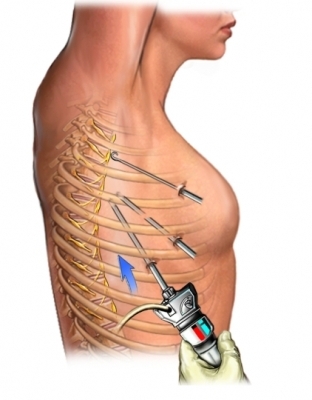 Keyhole incisions and specialized equipment are used for a robot-assisted thoracic procedure. You will be connected to a ventilator. This is a machine that moves air in and out of your lungs. Next, several keyhole openings will be cut in the chest wall between the ribs. One or more chest tubes may be placed into the side of the chest. These tubes will be used to drain fluid and monitor air leakage. A needle may be used to inject carbon dioxide gas into the chest cavity. The gas will make it easier for internal structures to be viewed. While sitting at a console near the operating table, the doctor will use lenses to look at magnified 3D images of the inside of the body. Another doctor will stay by the table to adjust the camera and tools. The robotic arms and tools will be guided by movements of the surgeon to remove organs and tissue. After the tools are removed, the doctor will use stitches or staples to close the surgical area. If you are doing well, the breathing tube will be removed. Later, the chest tubes will be removed. Limit certain activities, such as doing strenuous exercise, until you have recovered. Depending on the procedure, you should recover within a few weeks. Rea F, Marulli G, Bortolotti L. Robotic video-assisted thoracoscopic thymectomy. Multimed Man Cardiothorac Surg. 2005;(324). Sympathectomy. New York Presbyterian Hospital website. Available at: http://healthlibrary.nyp.org/Search/135,25. Accessed February 19, 2016.